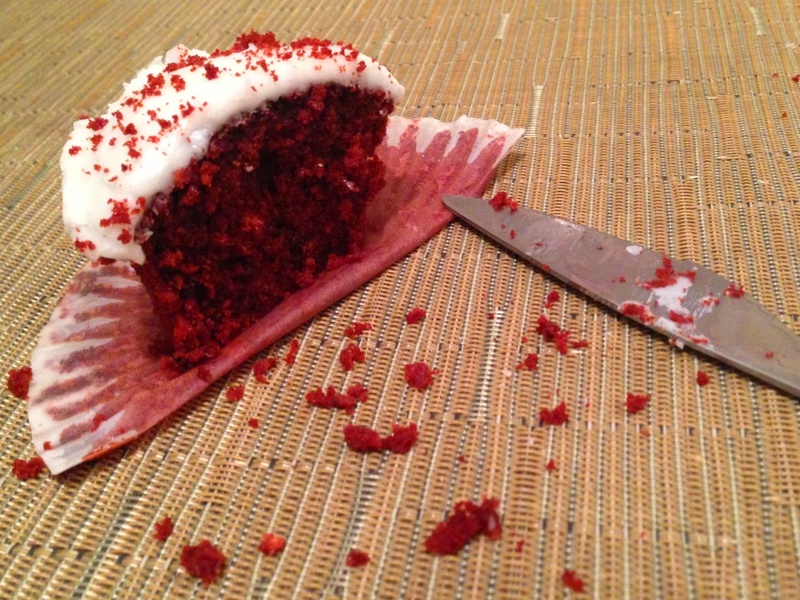 Red velvet is an American-originating fast-becoming cake classic. A lot of recipes make things more complicated than they need be – but these are quick, simple and just as tasty, without the complications of buttermilk, white wine vinegar, or anything else that you don’t know even where to start looking in the supermarket for. Topped with a cream cheese frosting, these are a sure fire hit for all kinds of parties, kids and adults alike, Halloween, Christmas, or anytime in fact for a quick chocolate fix! 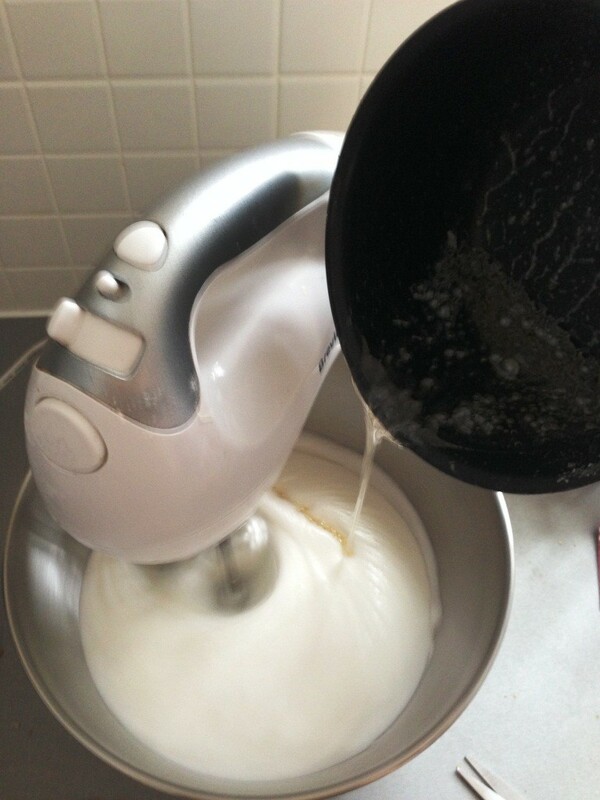 – Beat together the butter, sugar, and vanilla until light and fluffy. 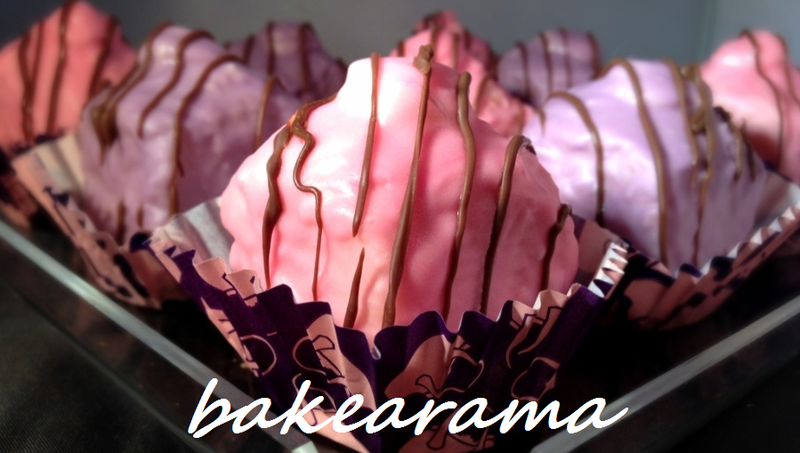 – Add the egg, food colouring and cocoa powder, and beat until well mixed. – Sieve the flour, baking powder and salt into the bowl, and carefully fold in. 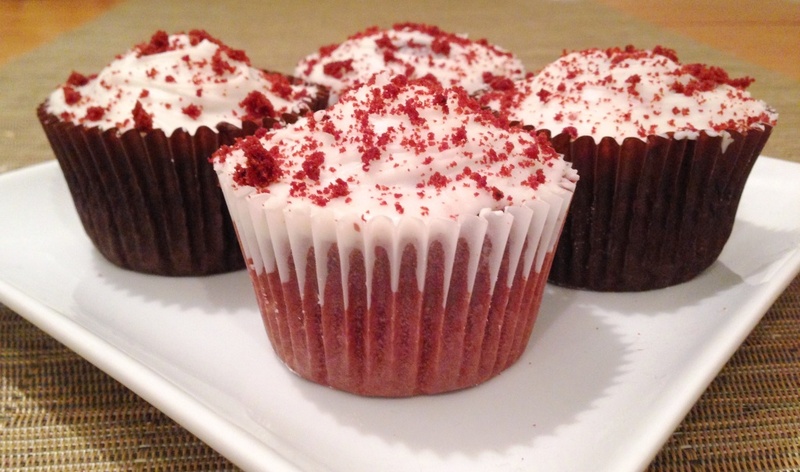 – Spoon into cupcake cases, and bake at 180 degrees for 10 – 15 minutes, dependent on size, until they are firm and springy when pressed lightly with a finger . Simply beat together all the ingredients in a bowl. Don’t over mix or the cream cheese might go runny – if this happens just refrigerate for 15 minutes before putting on the cupcakes. 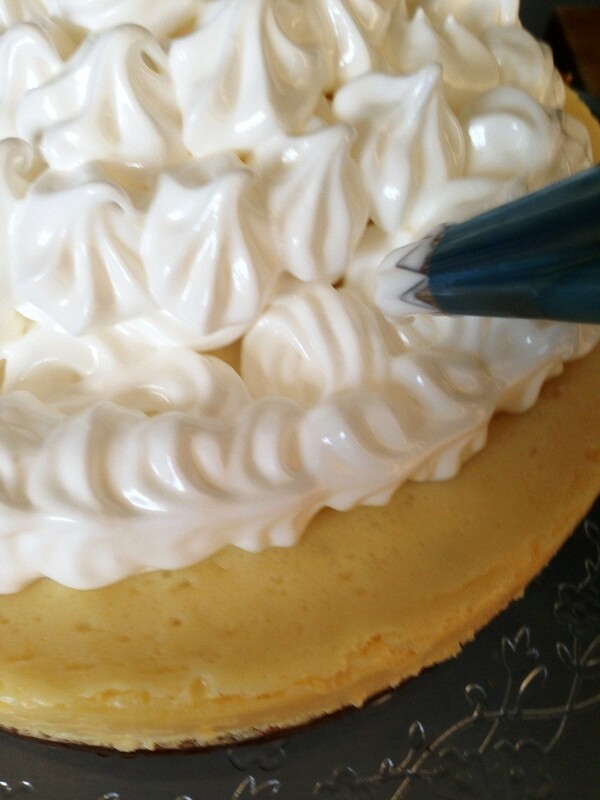 Cream cheese makes for quite a sticky icing so it’s not really worth trying to pipe it. A simple spread over with a knife and you’re done! 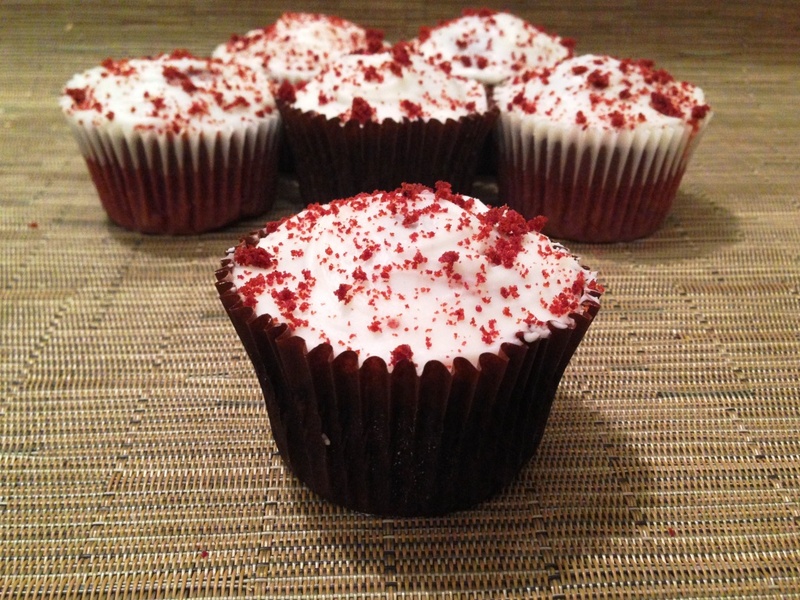 I topped mine with some red velvet cake crumbs, you can either trim a small amount off the top of one of the cupcakes, or separately bake a tablespoon full in a spare cake case. Any leftovers are great for taste testing! 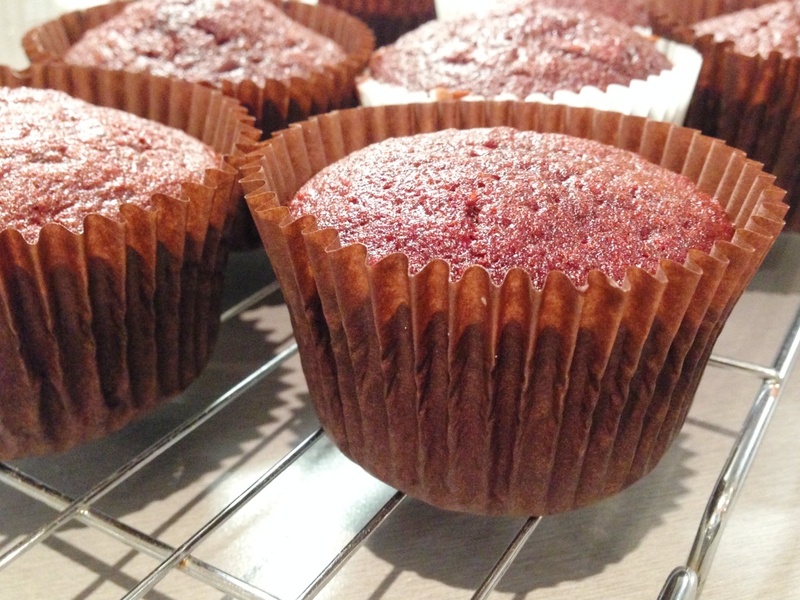 And inside – a light, fluffy cupcake, vibrant red in colour but with subtle flavours of vanilla and chocolate. 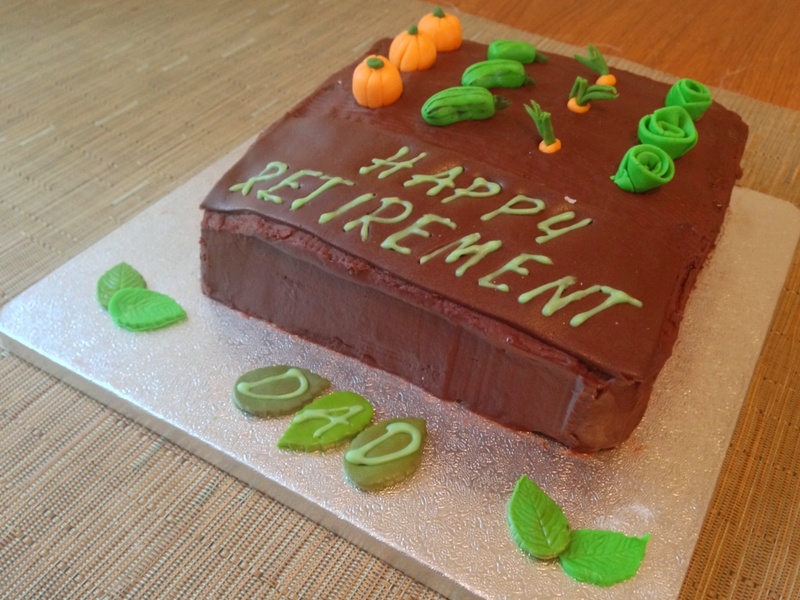 A couple of weeks ago my lovely Dad finally left his job of many, many years. 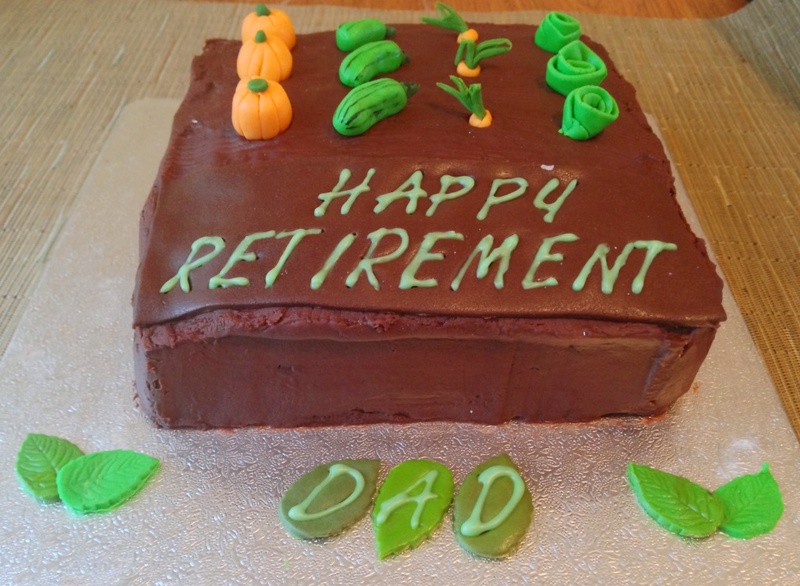 As we’re still working through the great glut of pumpkins he gave us, what better than to make a cake with his own home-grown produce! He is an avid gardener and I’m sure will be spending a lot more time on the allotment from now on. 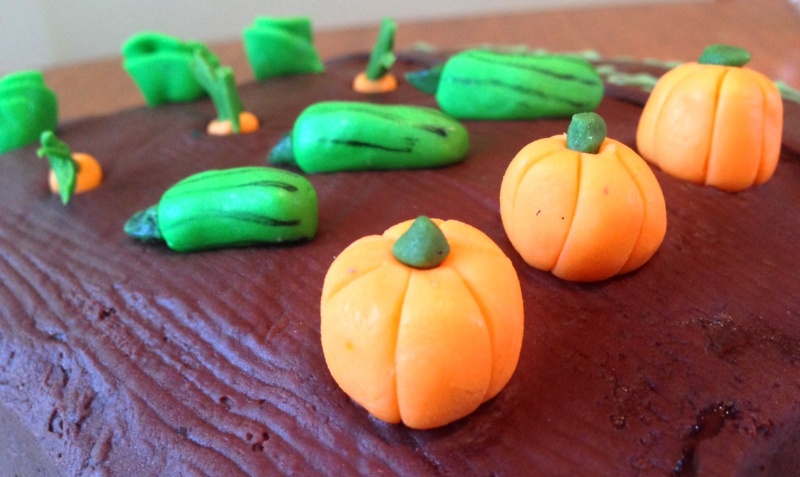 I used the same recipe as my Halloween Spiced Pumpkin Cake from a few weeks back, covering it in chocolate buttercream to imitate the soil. 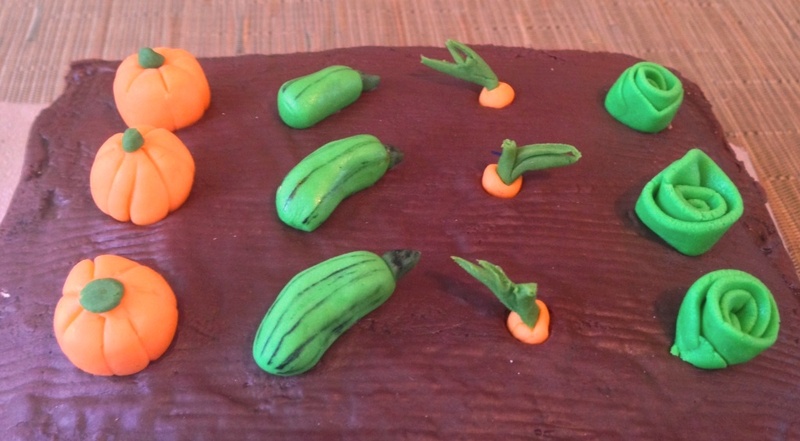 The vegetable patch I actually found quite easy to make – colouring up fondant in different greens and an orange, shaping, slicing, scoring the pumpkins, and shading the courgettes with a fine paintbrush. 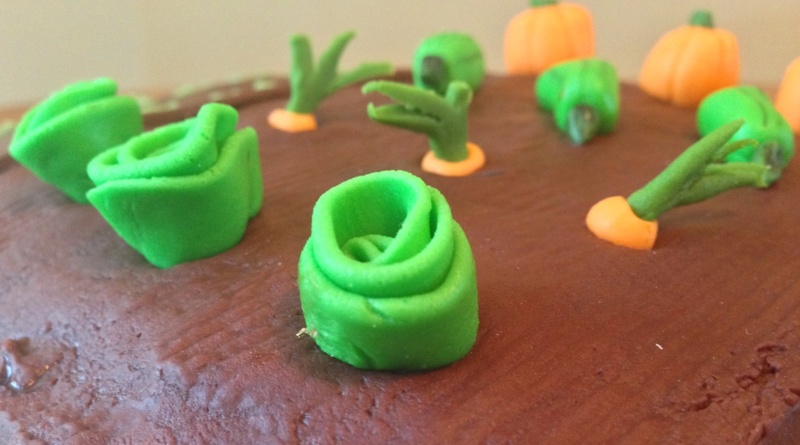 The finished vegetable patch – with the fondant simply ‘planted’ into the allotment by pressing gently into the still-wet chocolate buttercream. 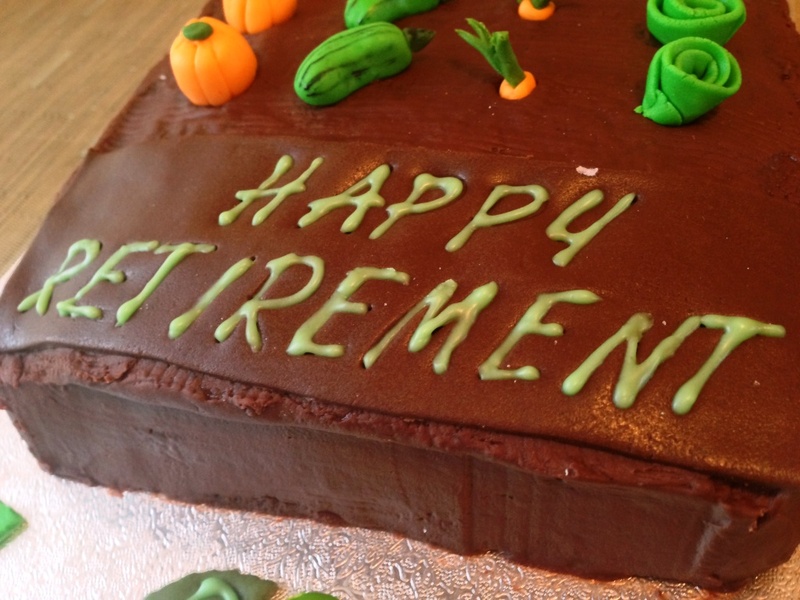 For the personal message on the cake, feeling less than confident with free-hand writing onto the cake, I used a matching piece of chocolate fondant, pressing in letter stencils before piping over with a light green icing. 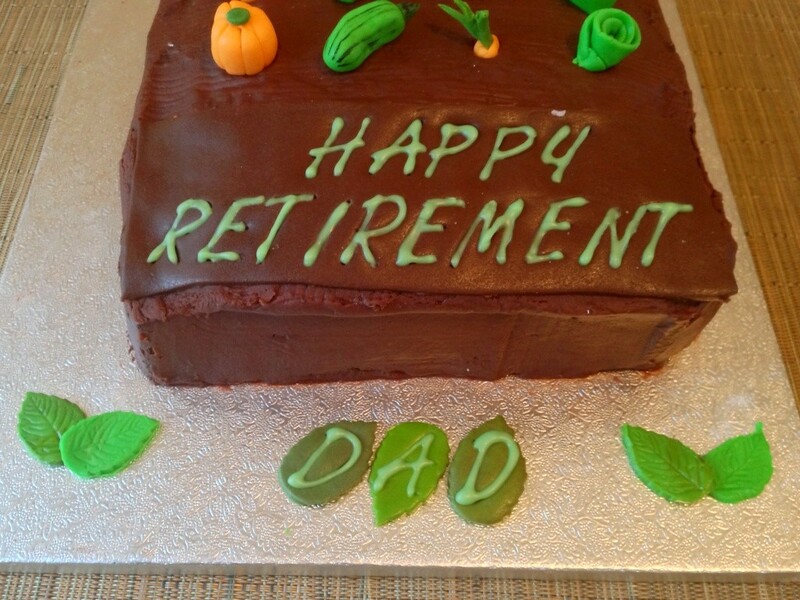 And to finish, matching ‘Dad’ personalisation on green fondant leaves set onto the cake board. A couple of weeks ago, we had company for Sunday dinner and of course I wanted to make a great dessert. Rob had been watching the 2012 catch up program of The Great British Bake Off, and his eye’s lit up at Ryan Chong’s Key Lime Pie. Of course he then turned to me and asked what on earth a key lime pie was, but that’s another story. 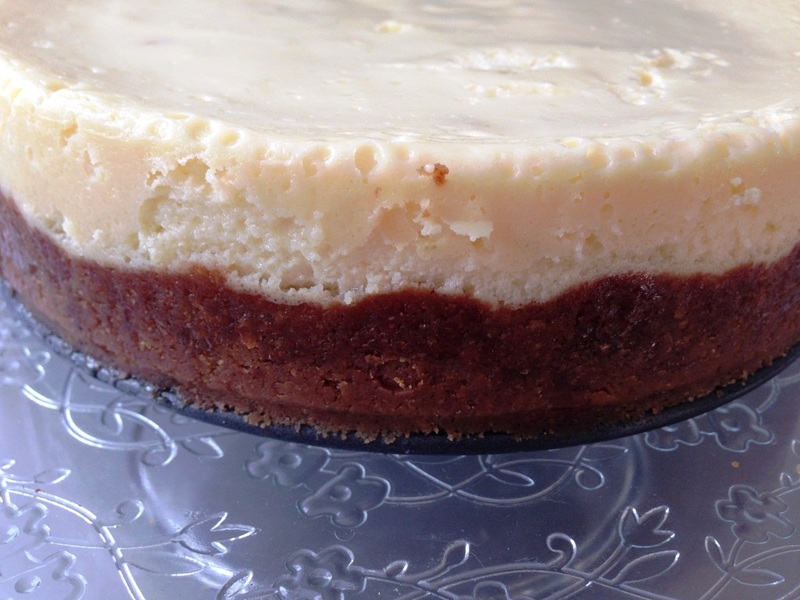 As you read through you’ll realise it’s not actually far off a cheesecake recipe – with the addition of the meringue topping. This is my adaptation of Ryan’s recipe – as “one of the best things the judges have ever tasted” it didn’t need much adaptation, just substituting a few ingredients for their lower-fat counterparts to save a few inches on the waistline! 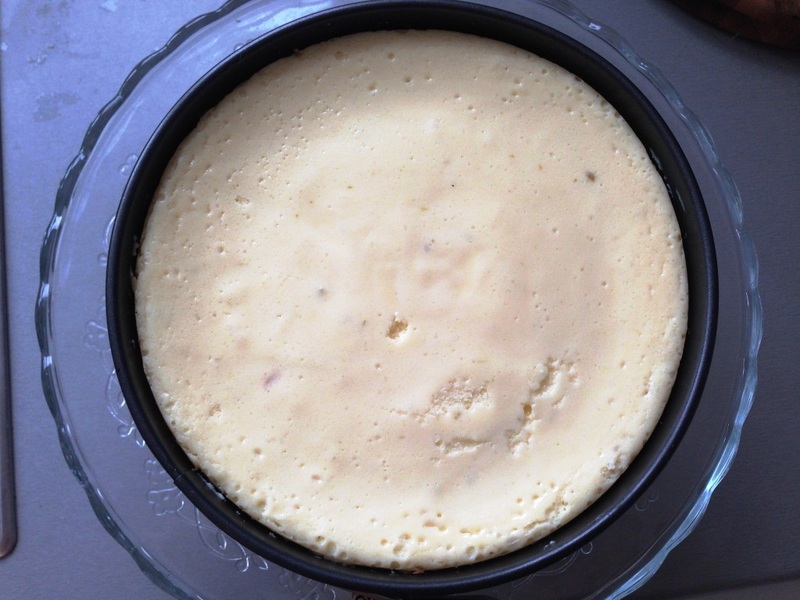 I opted for a biscuit base rather than pastry, I’d like to blame this on time pressures but mostly it was laziness…. 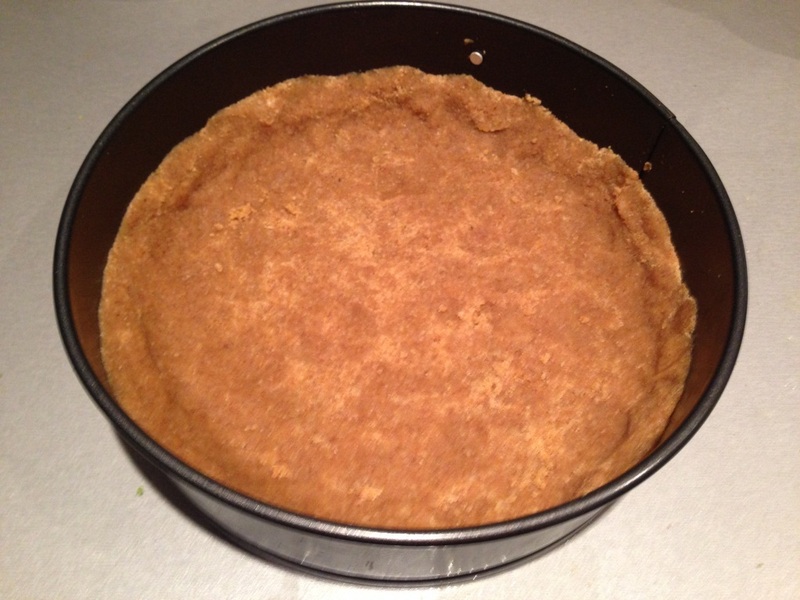 – Remove from the oven and cool in the tin. Cool in the kitchen for at least an hour, before chilling further in the fridge, overnight ideally. Once completely set it should start to come away from the edge a little. 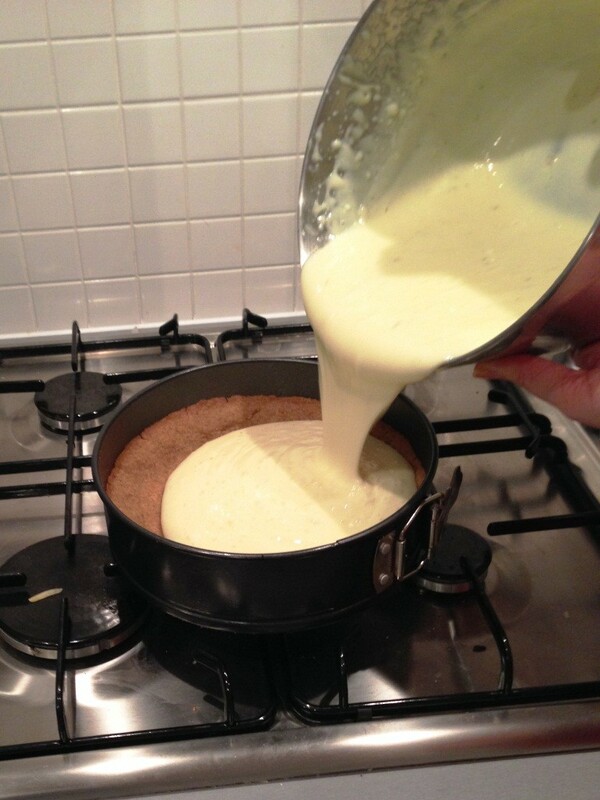 – Put the sugar in a heavy bottomed saucepan with 6 tablespoons / 100ml of water, over a medium heat. 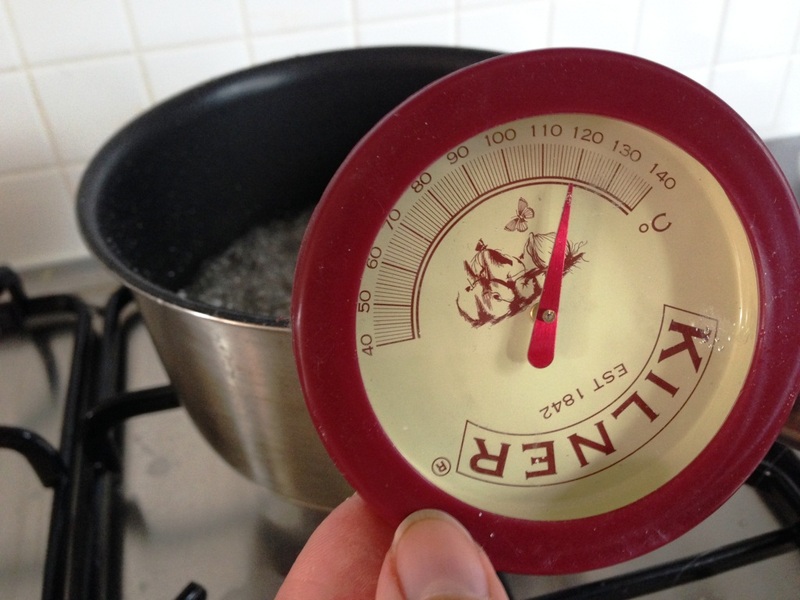 Allow to boil without stirring, until it reaches 120 degrees. It’s not as quick a process as you might think, mine took about 8 – 10 minutes to get hot enough. 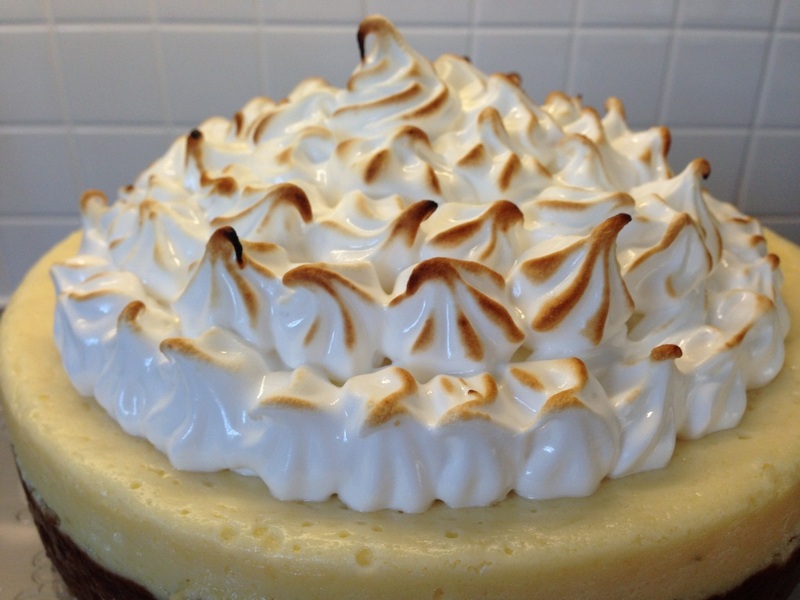 – If you have one, finish off by lightly toasting the outside of the meringue with a blowtorch. 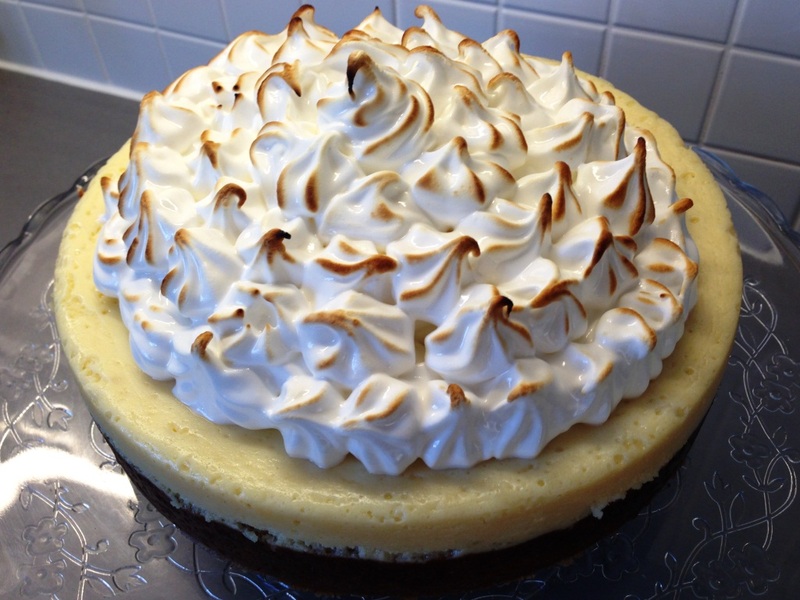 Move quickly across the meringue, don’t hold still in one place or it will burn. 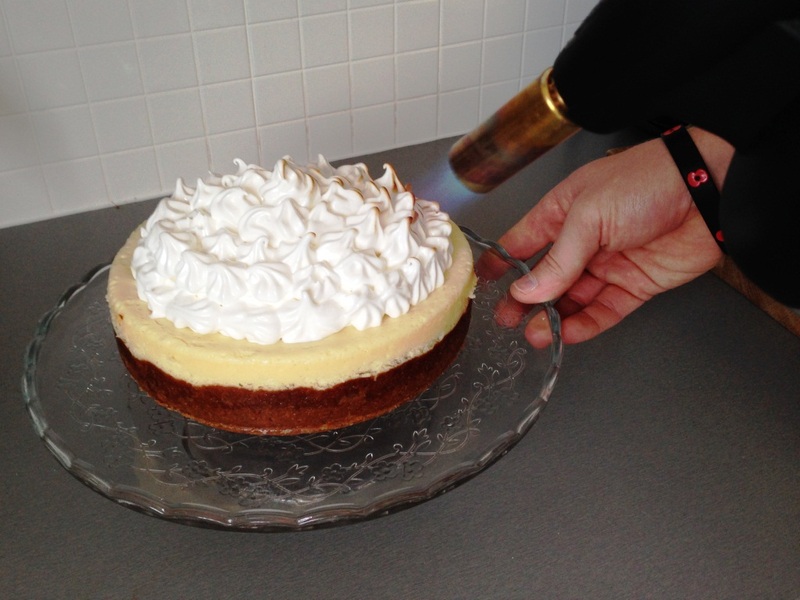 If you don’t have a blow torch, the meringue is already cooked so it’s by no means essential. You could finish with a sprinkling of icing sugar, or perhaps some lime garnishes. Refrigerate until you’re ready to serve – I made mine the same day but the leftovers tasted just as good the day after! 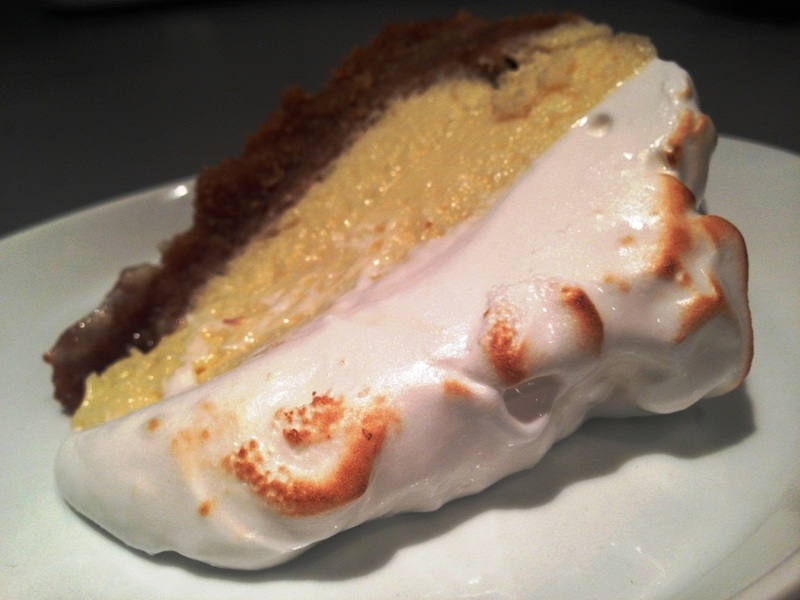 Cut inside – you can see the 3 distinct layers, a crunchy base, creamy filling, and rich meringue topping.